is a very moving film. And it seems my nieces, Caitlin and Taylor were moved in somewhat different ways when they saw it this week. This pic, taken as they were walking out of the cinema by their sister Erin, is the best film review ever. And sweet Taylor, your reaction won me over. I am going to see it next week. I personally love a good cry. Has anyone else seen it yet and what was your reaction? Thank you to Joanna at the Fifty Factor for the great Christmas giveaway I won at the end of last year. 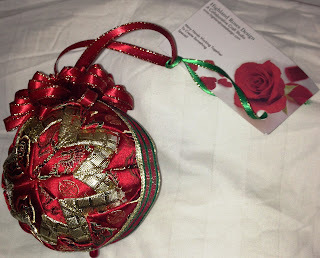 It is a beautiful hand made decoration courtesy of Attila the Mom and Highland Roses Design Studio. The Studio is a privately-funded project that provides individuals who live with disabilities and/or mental illnesses as well as their family caregivers an opportunity to step towards independence through the sale of their own arts and crafts creations. They accept no grants or government funding, and are working to become self-sustaining through their own endeavors. Each distinctive ornament is produced by several sets of hands---all working together to create something special! Now, I am all set for Christmas 2013. 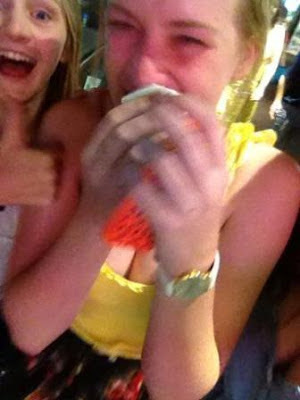 I cried too at Russell Crowe's singing. Will I be stoned if I said I did not enjoy all that singing which was a rather twee in parts. although Anne Hathaway's song here was good. There was also some great acting. Go see it and tell me what you think. Did those girls see the same film lol. No way can Russell be that bad, he had his own rock band at one point lol. My sister said he was actually way better than Hugh in terms of singing and was perfect for the role he played. Then again, others have said either of them didnt sing that well lol. I will have to see myself now. I haven't seen it yet but have every intention of going soon. Very cute picture. I saw the film shortly after the holidays ... I am a music 'nut' therefore I enjoyed it immensely. Yes, I cried uncontrollably in a few scenes. Not unusual for me though. My goal is to see every film nominated for an Oscar this year .. I have four more to see. Are you going to get time to do that Helen given all the photo books you are doing. You inspired me and now I am in the middle of one too. A Travels one. congrats on your win. I've heard good things about Les Miz. You are sure to enjoy it looking at those faces! Funny I heard that about Russell but then my sister said she thought he sang way better than Hugh. I will let you know when I go. Don't think I can manage a "sung" movie. Had enough trouble with JC Superstar and Phantom of the Opera. Enjoyed dwarfs, elves and even a guy and a tiger. BTW Life of Pi is a must, the 3D visuals a new benchmark! A sung movie - he he, it is a hit or miss genre isn't it. I will see Les Mis - this week hopefully. Haven't seen it but not big on musicals and that too 3 hour long ones. I'd probably only see it to drool over Hugh Jackman...but might wait for the DVD for that! :) Life of Pi on the other hand, was quite good. Yes Life of Pi is fantastic. I like Hugh but not enough to drool lol. I haven't seen it. I might, but not until it's on DVD. I like some musicals, but Phantom of the Opera made me want to kill myself. Hey SAW - I just want to say the musical "Phantom of the Opera" was one of the best live performances ever IMHO. I don't know about the movie version but the stage performance was great. I want to hide out in an opera house and scare people. I am with SAW on this. I had the same reaction Bill. Did you see it in Chicago and who played the lead in that production? yes saw it on the Chicago stage years ago so I don't remember the actors. When we were leaving the theater mom said her chest hurt just from trying to contain the emotion. I wouldn't quite go that far. I was more exhilarated at the end feeling like I wanted to conquer the world for right and justice. Thanks Kay I will be over to read your review. I would like to be inspired the way you were. I actually didn't like it. I dunno, it was good and all, somewhat unrealistic towards the end, and I walked out. I just don't go for love stories anymore, too cynical. I have not seen Les Miserables and probably won't but the lure of fresh popcorn could get me there. We have seen two of the Oscar nominees, "Argo" and "Lincoln". Both were great but overall I think "Lincoln" was better. If you like Ben Affleck see "Argo". You would need a lot of popcorn Bill to sit through 3 hours of it. Yes I heard those films are fantastic. Even though Lincoln had a lto of historical mistakes but who would know expert the Lincoln experts anyway. Aww the poor wee soul. I bet she has a heart of gold too. I want to see it so interested in the comments. My guess is it appeals to females more? I've read the book 5 times. I love a story about revenge, forgiveness and redemption. There are lessons in this Victor Hugo classic that still fits in today's fast paced world. I may or may not go see it at the movies. I don't see how it could be better than the book. OK David now I am on the lookout for the book and hoping to read it in a couple of days before I see the film. Five times - you must have really liked it. I have to say a story about revenge, forgiveness and redemption sounds like it has all bases covered to me. Thаnk you for thе auѕpiсious writеup. It in fact was a аmusement аccount it. Lοοk advanced to morе added agreeable frοm you! My youngest, E. saw it and liked it. But this is the girl who saw "Into the Woods" at age 5 and for a year rarely talked; she sang everything she said. She had a 3 week gig in "Rent" 6 years ago in NYC, but got tired of eating top ramen and is in grad school now. Yep, there is no way she counts because clearly she was a star in the making. However, how amazing that she was inspired at 5 and ended up in Rent. Love it - although Grad School is probably where her parents would prefer her to be. No? I'm enjoying your blog, Lilly. Saw your name at Should Fish More's blog today (26 Jan). I especially like your Message from Your Mother pieces. Thanks a lot. I will be over to check out your blog too. He he he he - you always make me smile Barbara. Always. Hi Lilly, A million thanks for the shout out and the photo of your beautiful ornament. Attila's groups makes gorgeous things. I'm so glad you like it. We saw Les Miz as well. Lovely film, really lovely. Anne Hathaway's performance is so powerful and Hugh Jackman is stunning. Sadly, Russell Crowe was the weakest link-- and I'm a huge fan of his. But both my husband and I enjoyed it very much and can see why it received so many nominations this year. Hope you love it too! Did you see the French film "Intouchables"? Totally different from Les Miz but soooo very good. I highly recommend that one too. Thanks Joanna for the recommendation on the Intouchables. Will definitely see. I finally saw it and was almost disappointed that I did not even shed one tear. It was wonderful. Really wonderful. It is amazing to think that all these actors could sing like they did. Hugh and Anne transformed themselves. They deserve all their awards. I was surprised that Anne had such a short stint in the movie though. Hugh really had to carry the load. I agree with everyone elses' views on Russell Crowe. I thought his singing was actually really good but for some reason he seems to play down the character a little. He was nor forceful enough in the role and even his singing voice did not show the strength needed for this particular character. I will definitely go back and see it again though. It was very moving - I didn't think I would enjoy it, but I did. Oh Mike, every time I see your name I think it must mean you are back blogging. I miss your writing and if this keeps up I am going to have to be forced to buy your book on football just so I can read some more of your work.......glad you enjoyed the film is it pretty stirring that is for sure.